Nanjangud is known as the Dakshina Kashi. Ancient name of Nanjangud is Garalapuri and also called Gulapura. 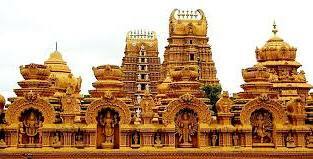 Nanjangud is located at a distance of 25 km from Mysore city. The famous Srikanteswara or Nanjundeswara temple is situated here.Nanjangudtemple, picturesquely built on the right banks of Kapila (Kabini) River, is one of the oldest temples in India.Here is Some Fact about Srikanteshwara or Nanjundeshwara Temple in Nanjangud. How to reach by Rail:The Nearest Railway station is Mysore station. How to reach by Road: KSRTC Buses, Private Buses and Trains ply regularly from Mysore City. 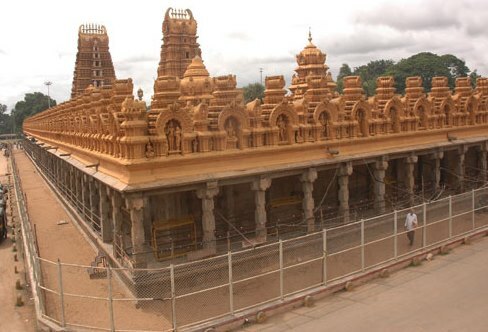 on the banks of River Kapila (also known as Kabini) in Mysore district.Shri Nanjundeshwara or Srikanteshwara Temple at Nanjangud is one of the ancient temples of Karnataka.The temple was built about 11th Century.Later, this temple has then been renovated by the Hoysala kings. Both Hyder Ali and Tipu Sultan had close associations with this temple. Wodeyar kings have provided various grants to renovate the temple.The temple is dedicated to Lord Shiva known as here Srikanteshwara or Nanjundeshwara.Nanjangud literally means the place where Lord Nanjundeshwara resides. Nanjundeshwara means the God who drank poison for welfare of the world. It is believed that sage Gauthama stayed here for some time and has installed a Shiva Linga, the idol of Lord Shiva. 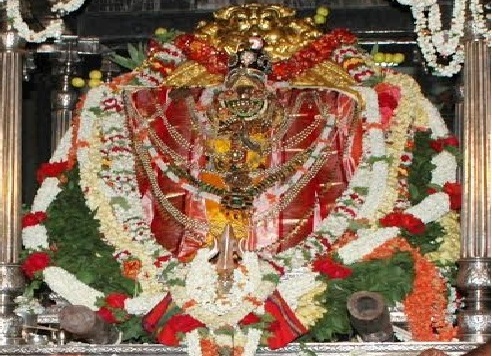 Lord Nanjundeswara also referred to as Lord Srikanteswara, Vishakanta, Nanjunda. 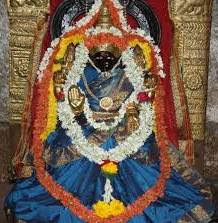 It is also believed that Lord Nanjundeshwara cures diseases of his devotees. The spacious temple also houses minor shrines of Lord Narayana, Chandikeswara, Parvathi, Natya Ganapathi and others. 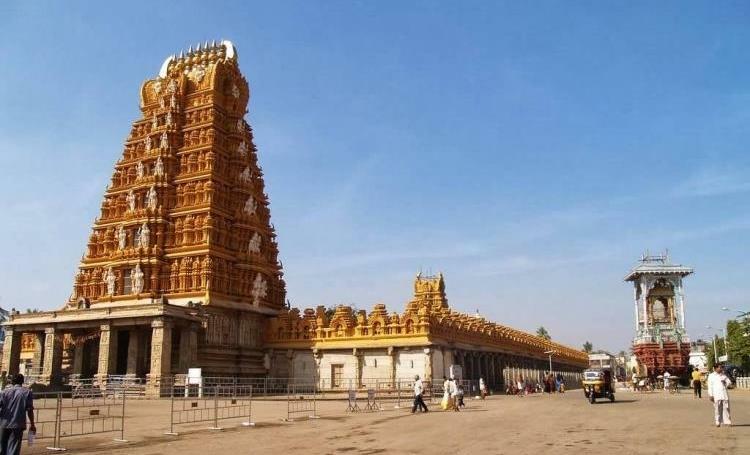 This big temple and measures 385 feet by 160 feet in dimension. The outer walls of the temple are about 12 feet high. The beautifully carved huge tower on top of main entrance has seven stages. 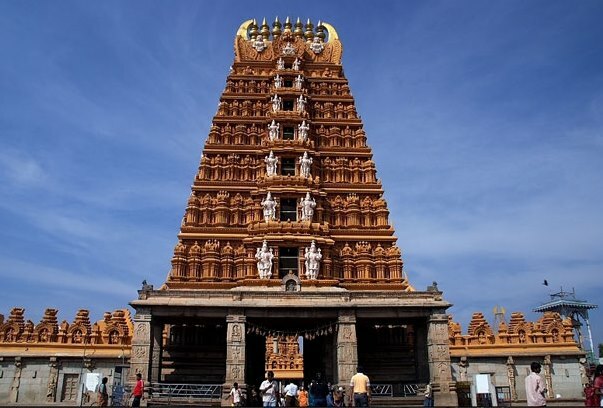 On top of it there are seven gold plated Kalasas flanked by two horns.The interiors of temple is beautifully carved with several scupltures of dieties Shiva, Subramanya, Parvati, Chandikeshvara and Ganapathi. The pillars are carved with beautiful sculptures.Even on the exterior walls of the temple there are beautiful sculptures. Temple will be open from Morning 6 AM to Evening 8:30 PM on Special Days, Sundays and Mondays.